Like everybody else in Atlanta, I woke up to cloudy skies this morning, but downstairs in my studio I discovered orchid heaven! 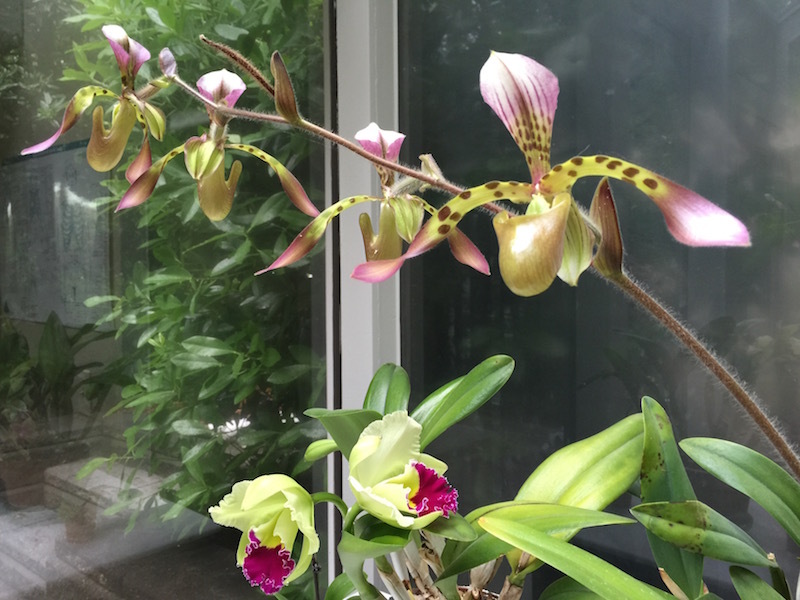 Underneath the outstretched Paphiopedilum Haynaldianum I discovered that my chartreuse cattleya had decided to open overnight. My Paphiopedilum Haynaldianum has been blooming so abundantly for at least the past six weeks that I have made not just one but three variations of a flower essence from various combinations of its five blossoms. Not to be outdone, my chartreuse cattleya has been preparing for its sixth opening in my studio. This time, it was developing not just the usual two but four blossoms. There are plenty of specimens for us orchid growers to love as scientists estimate that the orchidaceae family has between 21,950 and 26,049 accepted species in 880 genera. Up until recently my chartreuse cattleya has been my absolute favorite. I even photographed it and published its portrait in my most recent Amazon No. 1 best seller, Unlimited Energy Now. I am so ecstatic about orchids and my organic garden in general that Ramajon Cogan, who formats my books, had to save me from myself. I had wanted to publish not just one photograph but 72 separate photos of all my flowers before Rama intervened on behalf of readers everywhere and convinced me to select just one, just my favorite, as an emblem to mark the separate sections of my book. I had waited probably 13 months before the Paphiopedilum Haynaldianum bloomed. Then it began to get a bit dicey – which orchid exactly is going to be my favorite now? Who can make that sort of choice? Every day, when I go down to my studio to work, I examine each plant carefully. Earlier this week the bloom dropped off a white lady slipper orchid. I laid the blossom to rest next to its mother, thanking it for all the light and love it had brought into my life. I have been watching the buds form on the chattreuse cattleya and wondering when it would choose to make its entrance. When I first got this cattleya at the Atlanta Botanical Gardens, I specifically chose a plant not yet in bloom because I wanted to surprise myself. I had never before been a fan of chartreuse until the lemony green flowers with the purple throat opened. Then I took thousands of photographs, made cards that I sent to my friends and wished I could somehow bottle its amazing fragrance. Over the years I have lost the label, but I believe this is Brassolaeliocattleya Hsinying Greenworth. Orchids are the most evolved flowers on the face of the earth and make flower essences that open our upper chakras, connecting us to the divine. What is healing? Healing happens when we surround ourselves with high vibration energy.